1. 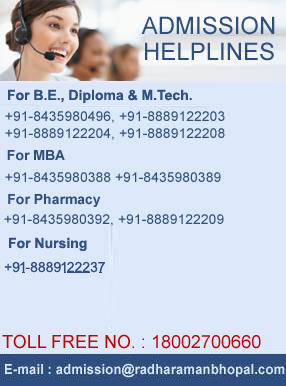 Approved by Pharmacy Council of India, AICTE and RGPV. 2. Faculty with top class National and International experience. 3. Passport procurement and Guidance and Institutional support to students desirous for going abroad. 4. Excellent results in RGPV examination. 5. Special emphasis on practical based learning. 6. Exposure to latest and current trends in Pharmacy Practice. 7. Well equipped laboratories, machine room (tablet, capsules, injections and other medicines) and pilot plants. 8. CPCSEA approved animal house. 9. Well maintained medicinal garden containing various herbs and special emphasis on developing herbal remedies for diseases like diabetes, cancer, heart and kidney diseases. 10. Relaxed and friendly teaching environment. 11. Novel teaching methodologies through computers and videos. 12. Regular interactions with International and national level experts from the field. 13.Guidance and Assistance for the membership of International organizations like International Pharmaceutical Federation (FIP). 15. Training and placement cell. 16. Extraordinary support from the well established Engineering colleges of the Group. 17. Special preparation for GPAT and other competitions. 18. Remedial tutoring for weak students. 19.Students not good in English language are given special importance and concepts are explained in Hindi/regional languages.